His 6-year-old was gunned down in Southern California on Saturday. Tyrell Ricks, 26, said Monday that he doesn't know why a man gunned down his 6-year-old daughter. He brought the girl, Tiana, to a celebration at a relative's Moreno Valley, Calif. home on Saturday night. One of his cousins was going off to college. Tiana told her dad she was thirsty, so Ricks fetched her something to drink and she followed him into the home's open garage, where people gathered. About 9:30 p.m., two men stormed up the driveway from the street – one shouted, another opened fire. Bullets smashed holes in the windshield of a car parked in the driveway, struck Ricks' pelvis and fatally wounded Tiana. A relative said the little girl didn't seem to understand she'd been shot. She just kept asking if her father was OK.
"That was the last time I saw my baby's face," Ricks said Monday, crying and trembling in a wheelchair. Tiana died less than three hours later, just after midnight on Sunday. "I have to bury my daughter." Ricks met with investigators on Monday to give them whatever information he could about the attack. Before that, he told NBC4 Southern California he had no idea why anyone would attack him and kill his little girl. Ricks recently moved to California from the Midwest and said he had no gang ties. 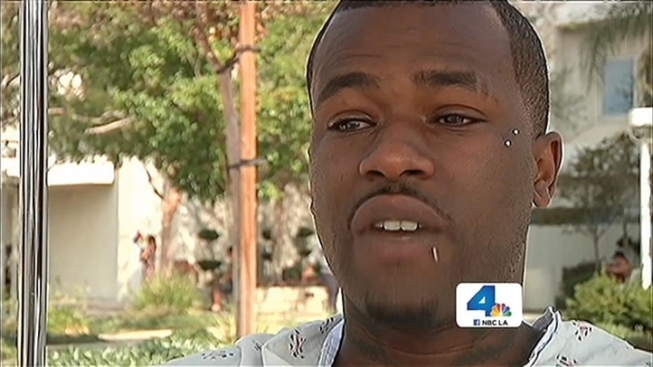 He didn't know anyone outside of his family in Moreno Valley. Tiana's birthday would have been just a few weeks away. She asked her father for a cell phone and some moccasins. "I could care less about my well-being," he said. "I loved her so much, and now she's gone."